We fell in love with this part of Turkey on our first visit there in 1995 and have been returning at least once a year ever since. The area has everything you could possibly need. Stunning beaches and scenery, activities to suit everyone, great food in a wonderful variety of restaurants. Excellent shopping (especially if you love a bargain). Plenty of historical sites to explore and the most genuine and friendly people you are ever likely to meet anywhere. In 2004 we were lucky enough to buy Villa Oleander, although at the time we brought it, the site was just a field with a cow in it!! But we fell in love with the spot even so and when the villa was finally finished it exceeded our expectations by miles. Oleander is a small development of just 2 villas and 9 apartments all positioned around a lovely clover leaf swimming pool with childrens section, all set in beautifully landscaped gardens. 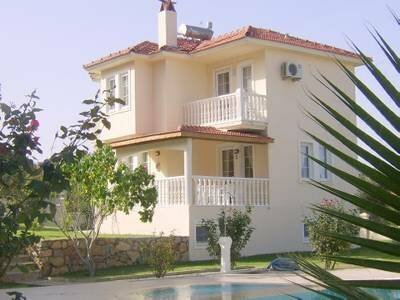 The villa is in a great position just on the outskirts of the bustling village of Hisaronu in the sort after area of Ovacik, nestling just below the mountains and with wonderful mountains views and fantastic views over the village. Villa Oleander is approximately a 10 minute walk from the village of Hisaronu although there are plenty of bars, restaurants and shops nearby. Its so easy to get around here as Dolmus (small minibuses) run all day and well into the night, you can catch these on the main road just about 2 minutes walk. There is also a taxi rank close by. Cars are very easy to hire if you want to but you will have no trouble getting around using local transport. The villa itself is very light and spacious and fully equipped to accommodate up to 10/12 people. The Villa is set out over 3 floors. On the ground floor is a well equipped kitchen / diner with a full size cooker, microwave oven and all the other equipment that you would expect. The dining table seats 8 people. From the dining area a door leads you on to the large shaded terrace which is fully furnished and is a wonderful place to eat al fresco or just to relax in the shade and look out over the lovely swimming pool. From the kitchen / diner a beautiful Turkish arch leads you through to the lounge area. In here you will find a TV / DVD player, with satellite channels. From the ground floor the marble staircase takes you up to the first floor, here are 2 bedrooms. The first bedroom has a double bed and an en suite with shower, the second bedroom is quite large and has a double bed and a single if needed. Both these bedrooms have furnished balconies. On this floor there is also a bathroom, with a full sized bath and over bath shower. On the lower floor are 2 further bedrooms, one with twin beds and the other is a triple room with a full size bunk bed and a 1 single bed. This floor also has a lovely large shower room. If you are travelling with a babies or toddlers (or both) we have a travel cot, safety gates, high chair, a booster seat and an Avent steam steriliser to help make life easier and all at no extra cost. There is also a washing machine, a full sized iron and ironing board and a hairdryer in each bedroom. The price includes a welcome pack, cleaning and linen change (on a 2 week stay) and all electricity etc. There is a safe for your valuables and smoke alarms throughout the property for your safety. Private transfers can be arranged from Dalaman airport at a cost of £80 return for up to 4 people and £20 per person over that number. Children under 3 travel free. PLEASE NOTE: WE DONT CHARGE HIGHER PRICES DURING SCHOOL HOLIDAYS!